He had never measured a footprint in his life, and what he did not know about bloodstains would have filled a library. A detective is only human. The less of a detective, the more human he is. Henry was not much of a detective, and his human traits were consequently highly developed. And I knew, too, (see previous post) that both authors enjoyed cricket, and even turned out occasionally for the same celebrity cricket team. An edition of The Sign of the Four, with introduction by P. G. Wodehouse! “Conan Doyle, a few words on the subject of. Don’t you find as you age in the wood, as we are both doing, that the tragedy of your life is that your early heroes lose their glamour? As a lad in the twenties you worship old whoever-it-is, the successful author, and by the time you’re forty you find yourself blushing hotly at the thought that you could ever have admired the bilge he writes. Now with Doyle I don’t have that feeling. I still revere hls work as much as ever. I used to think it swell, and I still think it swell. And apart from his work, I admire Doyle so much as a man. I should call him definitely a great man, and I don’t imagine I’m the only one who thinks so. And the introduction to The Sign of the Four was written in the 1970s, when Wodehouse must have been over 90. He echoes much the same lines. The full introduction is attached, pieced together from some rather excellent sources on the internet. We were great friends in those days, our friendship only interrupted when I went to live in America. He was an enthusiastic cricketer—he could have played for any first-class country—and he used to have cricket weeks at his place in the country, to which I was almost always invited. And after a day’s cricket and a big dinner he and I would discuss literature. The odd thing was that though he could be expansive about his least known short stories–those in Round the Red Lamp, for instance—I could never get him to talk of Sherlock Holmes, and I think the legend that he disliked Sherlock must be true. It is with the feeling that he would not object that I have sometimes amused myself by throwing custard pies at that great man. 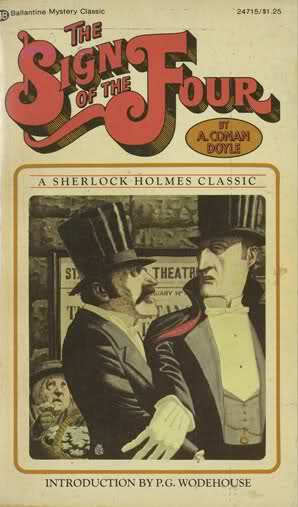 Here we have a man who evidently was obliged to watch the pennies, for when we are introduced to him he is, according to Doctor Watson’s friend Stamford, “bemoaning himself because he could not find someone to go halves in some nice rooms which he had found and which were too much for his purse.” Watson offers himself as a fellow lodger, and they settle down in—I quote—a couple of comfortable bedrooms and a large sitting room at 221B Baker Street. It all boils down to one question–Why is a man casual about money? The answer is–Because he has a lot of it.